Background: Autism spectrum disorder (ASD) is a developmental disability and is of public health importance. It affects not only the child and the family. It also has direct and indirect cost implications on the nation that are incurred in providing health care, support for education, and rehabilitative services. There is a lack of evidence-based estimate of the population prevalence of ASD in India. Therefore, this systematic review was aimed at determining the prevalence of ASD in the Indian population. Materials and Methods: We conducted a systematic review and meta-analysis of the published studies evaluating the prevalence of ASD in the community setting. A search within the published literature was conducted from different databases (PubMed, OvidSP, and EMBASE). The analysis of data was done using STATA MP12 (StataCorp, College Station, TX, USA). Results: Four studies were included in this systematic review. Of the four included studies, one had studied both urban and rural populations, and the other three had studied the urban populations only. The study from the rural setting showed a pooled percentage prevalence of 0.11 [95% confidence interval (CI) 0.01–0.20] in children aged 1-18 years; and, four studies conducted in the urban setting showed a pooled percentage prevalence of 0.09 (95% CI 0.02–0.16) in children aged 0-15 years. Conclusion: The scarcity of high-quality population-based epidemiological studies on ASD in India highlights an urgent need to study the burden of ASD in India. The proper acquisition of data related to the prevailing burden of ASD in India would lead to a better development of rehabilitative services in our country. 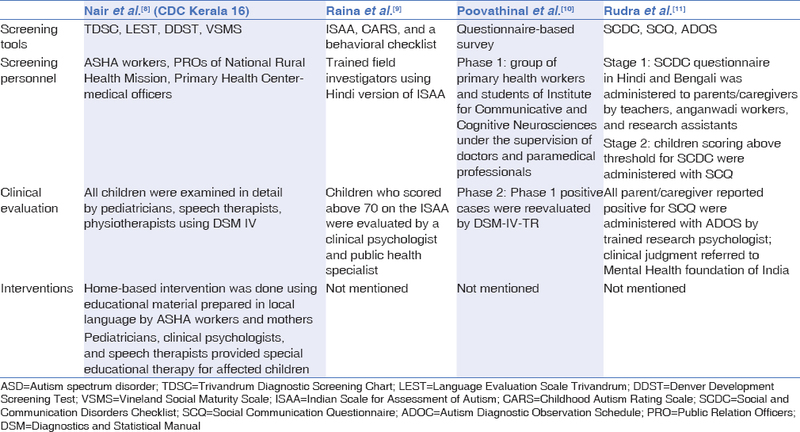 Key Message: This review systematically analyzed data from the Indian studies to determine the community-based prevalence estimate of ASD in India. It demonstrated a relatively low prevalence estimate of ASD in the community-based setting in India compared to the published international literature. This discrepancy could be due to the lack of standardized tools for the evaluation of the disorder in the pediatric population as well as because the included studies used variable criteria in their assessment of its prevalence. Autism spectrum disorder (ASD) is an important cause of developmental disability worldwide. Its estimated prevalence is 1% in the United Kingdom and 1.5% in the United States., There have been various epidemiological surveys to determine the prevalence estimates of ASD during the past decade. The data based on these surveys showed an increase in the prevalence of ASD worldwide. The prevalence was estimated to be 61.9/10,000 globally in 2012. India is a populous country of nearly 1.3 billion people with children ≤15 years constituting nearly one-third of the population. It has been estimated that more than 2 million people might be affected with ASD in India. Most of the reported studies on ASD are based upon hospital-based data and thus lack information on the prevalence estimates of this disorder in India.,, There are only a few studies focusing on its prevalence in the community settings. Furthermore, lack of uniform application of fully validated and translated autism diagnostic tools makes it difficult to estimate the exact prevalence of ASD. There is also under-recognition of the disorder due to a delay in the diagnosis of ASD at a young age. ASD not only affects the child and the family but also has direct and indirect cost implications on the nation as resources have to be utilized in providing health care, support for education, and rehabilitative services for these children. There is a lack of systematic reviews focused exclusively on the prevalence of ASD in India. Therefore, this study was designed to estimate the prevalence of ASD in Indian children below 18 years of age. We conducted a search within the published literature from different databases (PubMed, OvidSP, and EMBASE). The searches were current as of March 2018 and we identified articles with information on the prevalence of ASD in Indian children. Our search strategy included the following search terms: ((((((”Autism” [Mesh] OR “Autistic Disorder”[Mesh] OR “Autism Spectrum Disorder”[Mesh])) AND ((((infant) OR pediatrics) OR children) OR child))) AND India)) AND prevalence [Appendix 1]. We screened prospective/retrospective, cross-sectional, and cohort (hospital and community based) studies of children with ASD in the Indian population <18 years of age. The titles and abstracts of all potential studies were screened independently by three authors (AC, SS, and AA) through Covidence (www.covidence.org), which is recommended by the Cochrane organisation and is a core component of Cochrane's review production toolkit. All the potential studies identified through Covidence were classified as either 'eligible' and 'ineligible' studies. We retrieved the full text of eligible studies, and two authors (AC and JS) independently screened the full text, identifying the studies for inclusion, and recording the reasons for exclusion of the ineligible studies. Discrepancies, if any, were resolved through discussions with the third author (MS) and her verdict was considered as being final. The reasons for exclusion of those studies which were excluded from this review are mentioned in [Figure 1]. The data extraction table was prepared to extract data from the included studies. After data extraction, the primary author entered the data into the STATA version 12.0 software. We checked for any error of the data being entered in the STATA MP12 software by comparing it with the study reports. Three authors (AC, NJ, and KKT) performed the data analysis using the STATA MP12 software. The random effect model was used to analyze the data. Subgroup analysis was done between children with ASD diagnosed in the urban and rural settings. ASD was diagnosed with different diagnostic tools in different populations. The choice of the best diagnostic tool leads to an enhancement in securing the specific diagnosis of ASD in the community and hospital. The various diagnostic tools used to screen and diagnose ASD in the included studies were Diagnostic Statistical Manual-IV (DSM-IV), Indian Scale for Assessment of Autism (ISAA), and other tools listed in [Table 2]. All the studies screened and diagnosed ASD through a two-stage procedure, including the screening and confirmation of the disorder [Table 2]. All the applied tools have a similar diagnostic approach with multiple and different diagnostic questions. The four studies included in this systematic review have included the diagnostic screening of 130,599 children. Two of the studies were from South India (Kerala), one study was from Eastern India (Kolkata), and one study was from North India (Himachal Pradesh) [Table 1]. 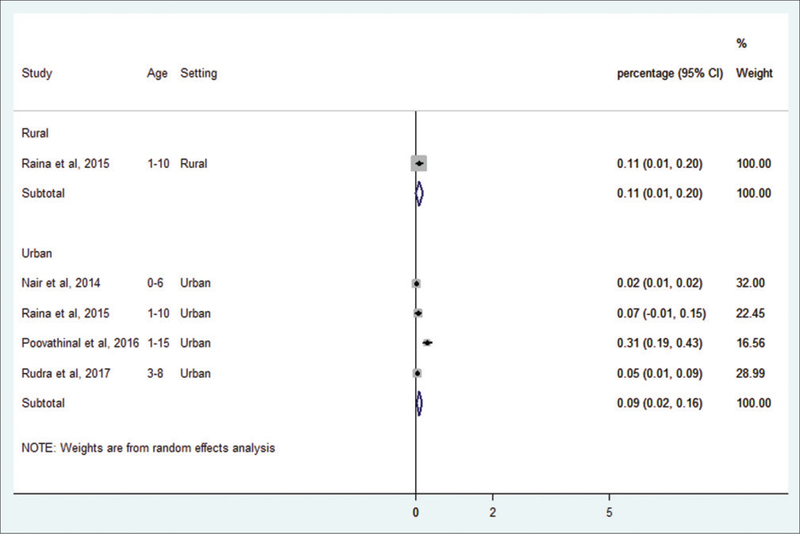 One study by Raina et al., had screened both urban and rural populations for autistic disorders. The sub-group analysis was done pertaining to the rural and urban settings. Of the four included studies, the one conducted in the rural setting showed a percentage prevalence of 0.11 [95% confidence interval (CI) 0.01–0.20 in the age range of 1–18 years, and there were four studies conducted in the urban setting showing the pooled percentage prevalence of 0.09 (95% CI 0.02–0.16) in the age range of 0–15 years [Figure 2]. This systematic review reports a relatively low percentage prevalence of ASD in both rural and urban community-based settings in India. There were surprisingly lower number of prevalence studies present in the literature, and only four studies were found eligible to be included in this review. All the enrolled studies were recently published and specifically belonged to the time period between 2014–17. However, all the four studies, which were included in this systematic review, have used a varied spectrum of diagnostic tools for screening of autism. Some studies have used a single diagnostic tool and others have used more than one diagnostic tool to diagnose autism. In a population-based prevalence estimate from the United States, the pooled estimated prevalence of ASD was 14.6 per 1000 (1 in 68) children aged 8 years. In a survey in the United Kingdom, the weighted prevalence of ASD in adults was 9.8/1000 (95% CI 3.0–16.5). In our systematic review, the pooled estimate of autism varied from the rural to the urban population from 14/10,000 to 12/10,000. These figures are relatively lower than those reported from the United States and United Kingdom. Our prevalence estimates were similar to the prevalence of 8.3/10,000 in children aged 3–12 years reported from the Chinese population. A recent systematic review of the South Asian (Bangladesh, India, Sri Lanka) population has reported the percentage prevalence rate ranging from 0.09% to 1.07% among children in the age group of 0–17 years with ASD. A study by Nair et al., (Centers for Disease Control and Prevention (CDC), Kerala 16) demonstrated the highest sample size with screening of 101,438 children. This study was conducted in Kerala and was aimed at diagnosing most of the developmental disabilities such as developmental delay, global developmental delay, autism, and cerebral palsy using simple and standardized screening tools. There is a need for such large population-based epidemiological surveys, which will be helpful in estimating the exact burden of ASD in our country. However, Nair et al., studied children in the age range of 0–6 years, which could be responsible for the observed low prevalence in this age group as the diagnostic yield is lower in the younger age group. Poovathinal et al., reported a relatively higher prevalence which could be due to the inclusion of children upto the age range of 15 years., However, the population screened by Nair et al., was larger, and therefore, the study had received a higher weightage in pooled prevalence estimates of the urban subgroup. It thus provided lower estimates in the urban setting. 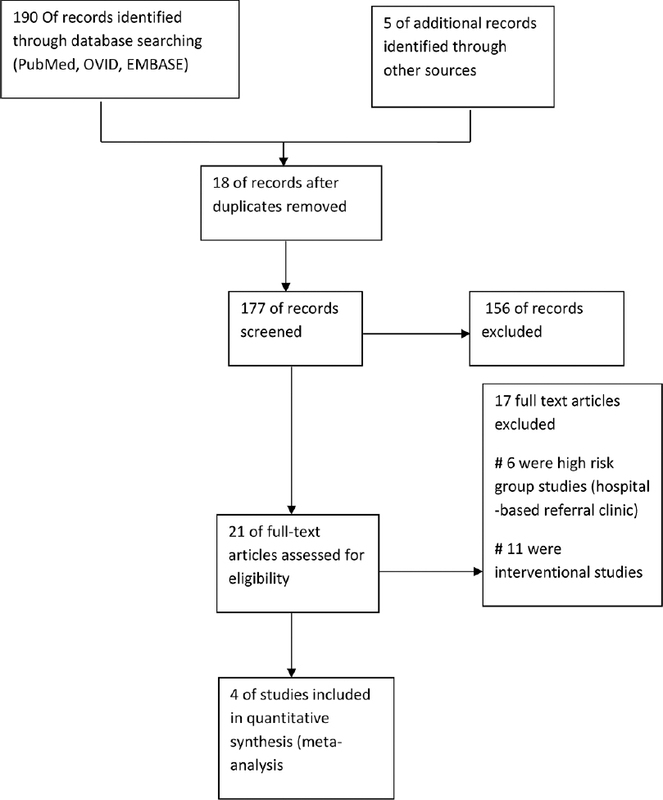 Our systematic review had a few limitations. First, we could not perform quality assessment of the enrolled studies due to the lack of standardized and validated tools that specifically focus on the prevalence of ASD. Second, there was a heterogeneity in the methodology among the applied diagnostic tools used in the included studies, which might have led to under- or over-estimation of the prevalence data. Third, the enrolled studies were recent, and therefore, we could not perform a trend analysis of the prevalence rate. Fourth, our subgroup analysis on rural versus urban population might not have been robust because there was only one study that had included data on the prevalence of ASD in the rural setting. This review systematically analyzed data from the Indian studies with the aim to determine the community prevalence estimate of ASD in India. This is a singular systematic review and it demonstrated relatively low prevalence estimates of ASD in the community-based setting in India. The conclusion should be interpreted in the context of the above-mentioned limitations. The study also highlights that there are scarce, high-quality, population-based epidemiological studies on this topic. As India is a vast country, there is an urgent need to have large population-based surveys with unified screening and diagnostic tools. Brugha TS, McManus S, Bankart J, Scott F, Purdon S, Smith J, et al. Epidemiology of autism spectrum disorders in adults in the community in England. Arch Gen Psychiatry 2011;68:459e66. Christensen DL, Baio J, Van Naarden Braun K, Bilder D, Charles J, Constantino JN, et al. ; Centers for Disease Control and Prevention (CDC). Prevalence and characteristics of autism spectrum disorder among children aged 8 years-Autism and Developmental Disabilities Monitoring Network, 11 sites, United States, 2012. MMWR Surveill Summ 2016;65:1-23. Elsabbagh M, Divan G, Koh JY, Kim YS, Kauchali S, Marcin C, et al. Global prevalence of autism and other pervasive developmental disorders. Autism Res 2012;5:160e79. Krishnamurthy V. A clinical experience of autism in India. J Dev Behav Pediatr 2008;29:331-3. Singhi P, Malhi P. Clinical and neurodevelopmental profile of young children with autism. Indian Pediatr 2001;38:384-90. Jain R, Juneja M, Sairam S. Children with developmental disabilities in India: Age of initial concern and referral for rehabilitation services, and reasons for delay in referral. J Child Neurol 2013;28:455-60. Kommu JV, Gayathri KR, Srinath S, Girimaji SC, Seshadri S, Gopalakrishna G, et al. Profile of two hundred children with autism spectrum disorder from a tertiary child and adolescent psychiatry centre. Asian J Psychiatr 2017;28:51-6. Rudra A, Banerjee S, Singhal N, Barua M, Mukerji S, Chakrabarti B. Translation and usability of autism screening and diagnostic tools for autism spectrum conditions in India. Autism Res 2014;7:598-607. Daley TC, Sigman MD. Diagnostic conceptualization of autism among Indian psychiatrists, psychologists, and pediatricians. J Autism Dev Disord 2002;32:13-23. Barnett WS, Masse LN. Comparative benefit-cost analysis of the Abecedarian program and its policy implications. Econ Educ Rev 2007;26:113-25. Nair MK, Nair HGS, Beena M, Princly P, Chandran AS, George B, et al. CDC Kerala 16: Early detection of developmental delay/disability among children below 6 years-a district model. Indian J Pediatr 2014;81(Suppl 2):S151-5. Raina SK, Kashyap V, Bhardwaj AK, Kumar D, Chander V. Prevalence of autism spectrum disorders among children (1-10 years of age)-findings of a mid-term report from Northwest India. J Postgrad Med 2015;61:243-6. Poovathinal SA, Anitha A, Thomas R, Kaniamattam M, Melempatt N, Anilkumar A, et al. Prevalence of autism spectrum disorders in a semiurban community in south India. Ann Epidemiol 2016;26:663-5. Rudra A, Belmonte MK, Soni PK, Banerjee S, Mukerji S, Chakrabarti B. Prevalence of autism spectrum disorder and autistic symptoms in a school-based cohort of children in Kolkata, India. Autism Res 2017;10:1597-605. Mukherjee SB, Malhotra MK, Aneja S, Chakraborty S, Deshpande S. Diagnostic accuracy of Indian Scale for Assessment of Autism (ISAA) in children aged 2-9 years. Indian Pediatr 2015;52:212-6. Jin Z, Yang Y, Liu S, Huang H, Jin X. Prevalence of DSM-5 autism spectrum disorder among school-based children aged 3-12 years in Shanghai, China. J Autism Dev Disord 2018 [Epub ahead of print]. Hossain MD, Ahmed HU, Jalal Uddin MM, Chowdhury WA, Iqbal MS, Kabir RI, et al. Autism spectrum disorders (ASD) in South Asia: A systematic review. BMC Psychiatry 2017;17:281.